Rubenerd: I Mad Men’d myself! I've fallen victim to many avatar related crazes, but this could easily be the best one I've ever wasted a solid half and hour on. 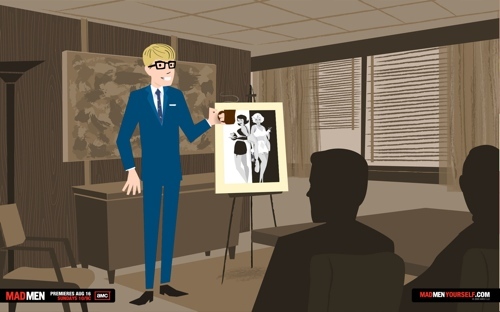 If you go to MadMenYourself.com, you can make yourself into a Mad Men style character with all the great 1960s graphics! When you're done, you're given three different sized images for various social networks and a spiffy desktop background. I like my blue suit and coffee cup :). It's a great advertising campaign, it shows people don't mind advertisements if companies actually take the initiative to try something new and engage with their audience — though some people apparently aren't a fan of such thinking ;-). I've never watched Mad Men before, but if appears locally I'll check it out. According to The Wikipedias it does play on SBS.